Hello! My name is Team-Z and I’m here to help those who are lost with Bullet Marker changes and those who want to enter this mad shooting life style. I had a guide a for the QS-Falconer-BM build and I know many of my readers are having trouble getting used to this Scout-BM thing. After all, we can’t run and shoot anymore! So I’ve decided to make a new Bullet Marker guide before updating my old Falconer one. I like to make image guides. 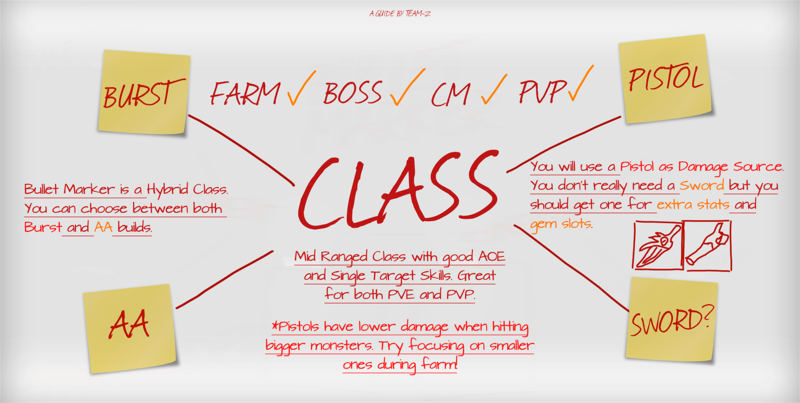 Most people don’t like to read, even little texts, so I’d rather make a guide that can reach even this type of player. Furthermore, I don’t like how text guides looks like. I feel overloaded with these lines and more lines of information. So I’m trying to make this guide a little different. Yes, you will see written information but I’ll try to make it more… pleasant to read. Maybe a little more clean! I won’t cover some details as Legendary Cards, equipment or restrained things like that. I think Re:Build comes to free us from the meta. Of course, meta still exist but now we can have fun our way. My objective is to give you guys the most information possible without locking any possibilities. I won’t cover PVP and alikes too. I’m not a PVP player so I don’t have the knowledge to talk about it! Feel free to correct me or ask me anything you would like to know (about the game O.O). I’m don’t know everything, but I’ll try to give everything I know! Hope you like it! You should really ignore this section. I’ve only created it because the guide must be written on the forum. Every information here is better explained on the images I’ve made. But if you want to read almost six pages of text, you should continue here! 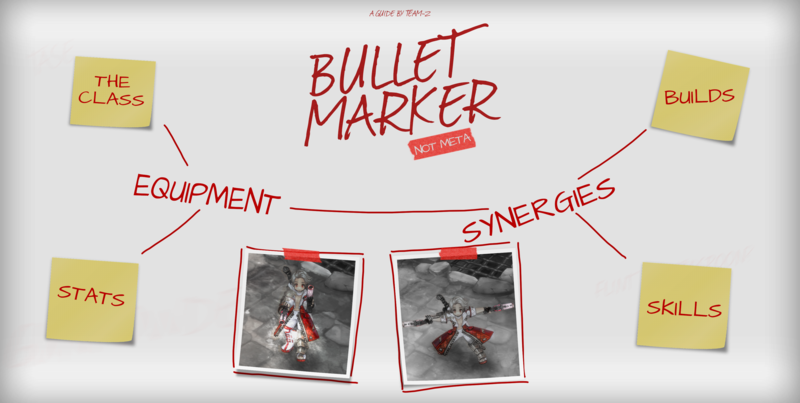 Bullet Marker is a Hybrid Class, Mid Ranged Class with good AOE and Single Target Skills. Great for both PVE and PVP. You can choose between both Burst and AA builds. You will use a Pistol as Damage Source.You don’t really need a Sword but you should get one for extra stats and gem slots. to know about those before searching for any equipment. The Scout Tree has many Crit Rate buffs. It’s important to get max use of those. Leather Sets gives you more Critical Rate and will be the best option for Bullet Marker users. Double Gun Stance is important because you need it to use some skills. It buffs your AA too. Max it for AA builds. Lvl 1-5 for Burst Builds. Silver Bullet adds holy property to your pistol atks and skills. Very good against Demon Lords/Velcoffer.Lvl 5-10 for AA Builds. Lvl 1-5 for Burst Builds. Tase hits your target with electric damage when someone atks it. Good, but you don’t really need more than Lvl 1. Napalm Bullet has Good damage, good AoE and low CD. Useful for Burst Builds. Lvl varies depending on the build. R.I.P. is fast and deal good damage. You will use it to kill remaining enemies. Lvl 1 for both Builds. Bloody Overdrive is your best skill. Just do it.Max. it. Full Metal Jacket has lost space to Mozambique Drill since the arrival of the ASPD update. It’s not useful anymore. Mozambique Drill is one of the best skills against High Def Bosses. Lvl 1-10 for AA Builds. Max it for Burst Builds. Smash Bullet has good DoT damage but it does not increase with skill level. Lvl 1 for both builds. Tracer Bullet is only worth because of it’s attribute: “Precision Shot”. Duration does not raise with skill level. Lvl 1 for both builds. Although Freeze Bullet limitation (only buffs AA and Outrage) it’s very good for “perma freezing” CM bosses. Lv 1 for both builds. Outrage is your best AA skill. Max it for AA builds.Lvl 1-5 for Burst builds. The order shown on this part of the guide is very personal. 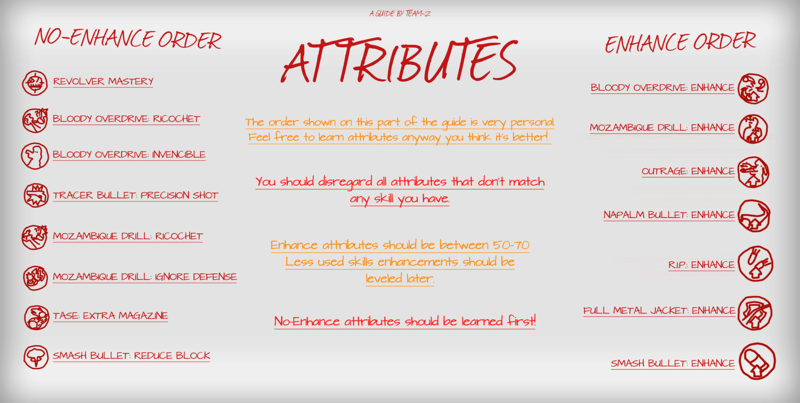 Feel free to learn attributes anyway you think it’s better! You should disregard all attributes that don’t match any skill you have. Enhance attributes should be between 50-70. Less used skills enhancements should be leveled later. No-Enhance attributes should be learned first! 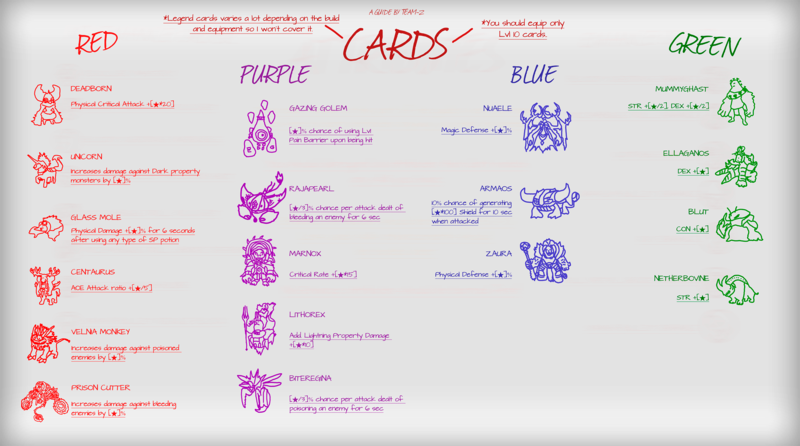 This part of the guide will give you many card options so you can choose the ones that fit your build. Legend cards varies a lot depending on the build and equipment so I won’t cover it. You should equip only Lvl 10 cards. Bullet Marker builds consist in 2 main classes and one filler. The First main Class will always be Bullet Marker. The second one will define what type of build you want: AA or Burst.The filler one will come in with some buffsor support skills. You can choose almost any class from the Scout Tree! Linker: Aside from Linker’s Electric Shock, that is very strong., the class can provide damage distribution with Joint Penalty. You can also combo Electric Shock, Joint Penalty and Tase… Tase will last longer because of Electric Shock and hit 50% harder with Joint Penalty attribute: Lightning. Schwarzer Reiter: SR is the exception from AA builds. You can’t use Double Gun Stance while mounted so you won’t level it or any skills that require it. But Limacon is an even stronger AA buff and you can use it while moving without any speed penalty. As for Bullet Marker skills, you will use all skills that don’t need Double Gun Stance. to compensate SR’s low burst damage. Thaumaturge: Thauma is a buffer. It will give you atk speed with Quicken, more damage with Swell Hands and will reduce enemies size to minimize pistol damage penalty.Atk speed will be even more useful in a future patch when Bullet Marker skills are affected by the status. Outlaw: Outlaw will provide high damage/debuffer skills and evasion/agro buffs.It’s a good class for control and can deal a lot of damage. The best combo is Throw Sand (blinds enemies), Brick Smash (stuns enemies), Rampage (Double hit because of Blind/Stunned enemies) and finally Bloody Overdrive (for invincibility) hitting 50% harder with Rampage 5 seconds buff. It’s just beautiful. Do I need two pistols? No. Double Gun Stance only needs one pistol. The other one is part of the skill. Can I make a Bullet Marker Assassin? Yes! Double Gun stance works with Weapon Swap since March 26 update. This means it won’t be disabled when you auto switch while using daggers skills! Does Double Weapon Assault work with Double Gun Stance? No. It won’t buff Double Gun Stance either. But it works with pistols now! Do I need a Good/Enhanced/Transcended Sword? No. Sword damage don’t affect any Bullet Marker skills.You will use swords just for its status. Does Limacon work with Double Gun Stance? No. Limacon overwrites Double Gun Stance while you are mounted. Furthermore, Limacon works with secondary attack button while Double Gun Stance works with the primary one. You can’t attack with Double Gun Stance while mounted. Does Lightning Hands work with Double Gun Stance/Limacon? Yes. Lightning Hands will give you an extra hit in the end of every attack. The damage depends on the skill level/your secondary phys atk. Can I run while attacking with Double Gun Stance? Does Shinobi Clones clone Bullet Marker Skills? No. Shinobi clones only clones Shinobi’s skills now. Is Free Step like Running Shot? No. Free Step is just an evasion buff. Does Double Attack work with Double Gun Stance? The additional hit won’t show but you’ll see the damage increasing every time it activate. The Critical Rate buff works too. Does Pillaging work with Double Gun Stance? Does Wastel Sword work with Lightning Hands? Yes. Wastrel Buff can proc every Strike Attack.Lightning Hands is a Strike Attack buff. So refreshing to see how beautifully it was done. 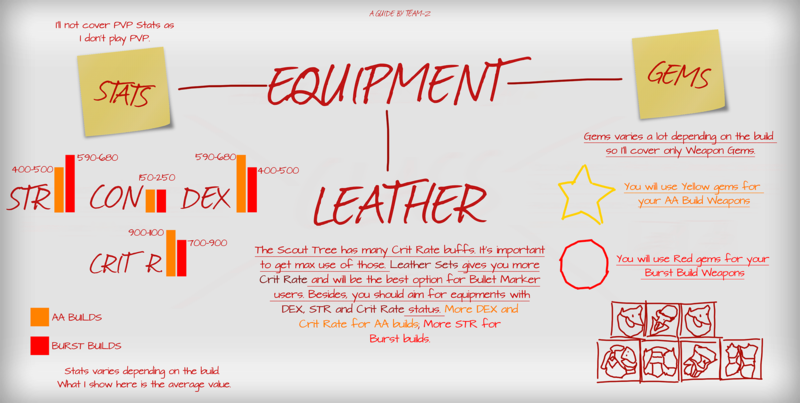 Not only beautiful, but useful, cause you made it so easy to understad (even for me, who haven’t played with Scout yet or BM before, can understand it) with the color and drawings. Maybe I’ll give it a shot. Why is werewolf card not listed in the list of cards? is it that bad? Also why are players using nether bovine card to add strength for a AA build? What kind of gems should I use in my armor Green or Yellow? ww card is overkill for the game system right now (wasted 1 class and 3 card slot). nepa set alone can give you a so-so crit rate up to 40-50% crit chance. More dex isnt giving noticeable attack speed anymore. I am confuse right now haha. I see people using Poison bee card in purple and a monkey card in red, is this setup better for AA. Should I use instead Marnox x3 for crit chance? I have the Nepa level 350 acessory set on me. I’ve already played biteregina… But I don’t like it. I think you should test it. Lvl 10 Cards are not that expensive. Purple cards are just fillers. There are no best options. It’s more personal. I don’t have my PC with me right now (I’m changing some parts) but I’ll add Biteregina and Velnia Monkey to the guide as soon as I get my PC back! When you say it is a “Burst Buid” are you saying that the AA have heavy spikes damage? Where as the AA build relies of constant damage with lower spike damage. Also if main hand is meant for stats why do we need to put gems in the main hand since it affects the damage range only. Gems affects your character status directly. If you put yellow gems in your main weapon, it will give you Phys Crit Atk, directly to your status. Your character Phys Crit Atk affects both your Main and Offhand crit atk. 5 Double atack works with DGS? well here is a mistake, idk if is a bug but the buff in the scout do give damage to DGS, it give damage to DGS and Outrage so yeah its works but only in AA ofc test it yourself just get a neutral damage on you subweapon and cast the skill you will see the damage increase really easy. 2 Centaurus card is good only for farmer/CM bms but what can i say bm is actually no that good in CM yeah cause you dont have that many aoe skill so if you want to run CM go for Mergen/falco, Pyro/Ele, Pyro/Chrono or Doppel that are the strongest in CM atm so yeah i dont really tell people to use Centa in a BM cause of his lack of skills and his no that good CM power ._. 3 GG card is good for early stages of the game or in PVP but once you hit end game use marnox yes or yes current hit cap is hard to get so yeah you want as much crit rate as you can to use that critical atack def give. 5 On green cards is really good just take note Mummy for balance, Ella for Atack speed (if you have good ping) or critical atack, netherbovine for normal damage or low critical people, Blut for pvp or if you are using Leather se go for Blut. 1- SR BM is ok but really i only see the uses on pvp outside pvp i dont think is a really good combo. 2 - Thauma is crap is not for AA or Burst is for FARMING only or support at most yeah thauma give you AA speed buff but is useless if you dont have the ping, plus it gives a MAX atack buff … but thats all its gives for damage maybe you can use shirk body but since its dont work on bosses then is no that good. 4- Your forget the Corsair!, yeah if you ask me the build is better to go BM/Corsair/Your pick and why is it? let me put it on hand, corsair have a perma 20% damage buff that buff ALL BM skills plus have fever buff that is a 40% damage to ALL THE PT! plus have 2 normal skill that are really fast and have a normal damage. 5 - Assassin yeah the assassin is viable i may say that is the best build in pve lol, why? well assassin unbuff DGS but is not really that much of a problem, the problem with assa is that you need a GOOD DAGGER AND PISTOL so yeah is expensive AF in weapons, but if you do have them and can master the gamplay, you have a really strong rotation and skill in both classes so yeah assassin and bm can be used in both PVE and PVP. First of all, thanks for the reply. I play BM since it’s out and it’s the only character I really use, but it’a always good to have some help. My guide here was not made to give you the best meta build. It is meant to help those with doubts about the skills and class. 2- You can use all your pistol skills with silver bullet lvl 1 and then, when you have to use it again, it will be UP already. 3- Mozambique Drill combined with Linker is a very good skill. Long before linker it was very used for Burst builds. Many overheats and when the atk speed thing comes up, it will be even better, like you said. I’ve made some tests in kTest and it’s really cool. 4- Some people don’t like outrage and won’t use it even if it’s your best skill. Burst builds usually go for one DGS point, so Outrage won’t receive that much DGS damage buff so it won’t be as strong as you tell. Yes, I find Outrage quite strong and useful but I’m here to show options, not meta. If there are those who don’t like Outrage, I’ll give them some more options! 1- These are options. I use Deadborn and I like it very much. If you like centauros go on and use it. I’m here to show the best tested (by me) options I know. Soon I’ll add Biteregina and Velnia Monkey like @marcvalbabista said to. These are all optional. You take what you like most. 2- And I don’t know what Bm you are playing. Lack CM power? I’m an Outlaw, Bm, Enchanter and I can easly solo CM till lvl 5 (even with my old 350 primus raffye pistol). If I have a cleric by my side, why not lvl 6? 3- GG card is, as I said, optional. Some of my friends rather use it than others. 4- Armaos is on the same page as GG card. 5- Thanks for the overview! 1- It was very used. People like the build and it’s a possible and plausible one. As I said: I’m trying to cover all questions and builds people might have/ask for. 2- Thauma isn’t crap. You can really get some good use of it for Burst builds and AA ones. Some people like buffing - AAing. And for those who don’t thauma still have some skills like shrink body and quicken (very useful skill, like I said). Shrink body don’t need to work on bosses for being considered a good skill. Quicken can give you more equipment status option as it will lower DEX requirement. I’ll add Farm to thauma too, as soon as I got my PC back. 3- Outlaw is a very good class to play with. You can go up to 1300+ evasion without problems. Even Velcoffer will have some problems hitting you. Furthermore it have very good skills. As I said: It’s not a meta guide. It’s a guide to help those who want to play the game the way they want to. 4- I didn’t forget corsair. I’ve said that the build consists in 2 main classes and a filler one, that won’t define the build itself. Well, corsair won’t do it, so it’s a filler class. It will just give you more damage. No combos, no interactions, just more pistol/dagger damage and fever damage. Yeah, Dust Devil/Hexen/Quick and Dead are very cool. 5- Did you really read my guide? Or my FAQ? You’ve said things (like that) that I’ve already said on guide. Thanks for the reply and the tips. But here I treasure gameplay and player options over meta. Take a look at the introduction, please! what about WW+sneakhit+nematomas set? only useful for PVP? Block isn’t a big problem on PVE so nematomas isn’t that useful. You can go with WW and Sneakhit but it will be overkill. We can get a very good amount of crit rate with equipment and buffs already. But it isn’t a bad choice. You can get it as a filler as it won’t define the build itself. Lachrymator + Napalm Bullet is very cool too. Well… If you don’t want to invest in crit rate you can still use this combo and it won’t be overkill. You’ll have other equipment options. Maybe more CON/STR/Evasion/Def instead of crit rate. Maybe plate? 1 - No really FMJ is crap i mean AA have more damage even if you want to burst the velco statues dont use FMJ is waste time and many skill points are used on the skill to do damage trust me. 2- silver bullet is 18 sec only 10 sec outrage is 10 second and BO is like 8 second yeah you can use the skill on the time but if mobs move or you have a little lag spike thengg and rotation go to crap so yeah max it cause it cover all the skills and even AA and if people dont know AA using DGS do more damage than FMJ or even MD cause of the animation of the skills. 3.- Check MD is not good only if you have attribute 100 cause damage is good yeah but animation is ultra slow you use 1 MD and you can AA 5 times… yeah MD is not good atm it was op before rebuild atm nope only after buff in the future. 1 - Mine is not opinion is a FACT sorry to be rude again but if you get like 15k damage then unicord card for example is like giving 1500 damage in one card and the deadborn is 200 damage and only in critical so yeah they are not good, and plz don’t use bitergina and velnia don’t use 6 card to do what 3 cards can do. 2 i m playing a better bm trust me, i don’t need a cleric and i solo bm in 10 minutes but know what? doppel wiz falcos can solo it in 6-7min and stage 7 still alone in 10 minutes … yeah the same as me to satge 5 and i m talking about lvl 380+ maps so yeah bm is not that good in cm compared with true cm classes. 3.- As i say GG is for PVP or early in end game you need card to boost damage cause yeah dps classes need as much damage as they can get thats how you get number 1. 4.- Armaos card is BAD is a shield but why shield? i mean in early game you don’t need the shield and in late game you have equip so def increase cards are better, i mean you can use armaos but telling a new player to waste 4 - 6m!! in lvl up a card that will almost never be of use is not good plz don’t do it.